Ivy crocheting. Photo by Sharon Kallis. In 2009, we started a pilot project in collaboration with local artist Sharon Kallis that took a creative approach to ecological restoration in Stanley Park. Through the pilot project, we found that English ivy, one of the main invasive plant species in the Park, can actually be repurposed and used as bio-netting for erosion control. With financial support from the Greenest City Communty Grants program and the Vancouver Foundation, this year we are putting into action what we learned from the pilot project to control erosion on a slope which had previously been cleared of English ivy along the north side of Lost Lagoon. This multi stage project began with the removal of English ivy by a team of volunteers. The vines were then processed and crocheted with the help of volunteers using the fence on top of the Nature House as a crochet hook, producing mats of various lengths and widths. The mats were hung to dry and are scheduled to be installed in early October. Bound with willow stakes, the crocheted mats will secure soil onto the slope and native plants will be planted to grow through the holes. Over time the bio-nets will decompose and the slope will become restored as the roots of plants begin to stabilize the slope preventing further erosion. 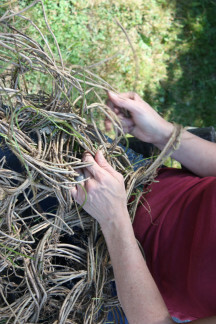 You can join eco-artist, Sharon Kallis During the Stanley Park BioBlitz, August 24 and 25 from 12-2:30 pm and 3:30-6 pm, eco-artist Sharon Kallis will be in the Rose Garden working with the community to crochet more mats using invasive plant materials. Come on by to try it out for yourself! You can also read more about Sharon’s fascinating eco-art in this week’s Georgia Straight.